A wonderworking Athonite icon of the Theotokos, with the epithet "Joy and Consolation", which was considered lost, was found in a monastery in the region of Ryazan and will be returned to Resurrection (Novodevichy) Convent in St. Petersburg, according to a report from the website of the Metropolis of Ryazan. The icon of the Mother of God of Joy and Consolation was the primary icon for veneration in Novodevichy Monastery, which was founded in 1849 in St. Petersburg. After the Revolution, the Monastery was closed, looted and destroyed. It was believed that the icon was transferred to Tambov, where it was destroyed by fire. Meanwhile, in the 1990's a resident of Tambov found and donated the icon of the Panagia of Joy and Consolation to the Monastery of the Dormition (Vyshenskaya Uspensky) in the region of Ryazan. The Abbot recently decided to proceed with the restoration and found an inscription on the back which is of the same catalogue with the miraculous icons of Mount Athos. In the festal calendar of the Church it is commemorated on January 21st. "On the eve of the birth of the 200th anniversary of Saint Theophan the Recluse on April 27, a procession from Vyshenskaya Monastery to St. Petersburg will take place with all the sacred things of the Monastery, including the relics of Saint Theophan. Together with the sacred things of Vyshenskaya Monastery there will be an official transfer to Novodevichy Monastery of the icon of the Mother of God of Joy and Consolation", said the Abbot. With the blessing of the Metropolitan of Ryazan, before the revered icon of the Panagia is given to St. Petersburg it will be given for veneration by the faithful: March 9-16 in Ryazan and March 16-23 in Kasimov. 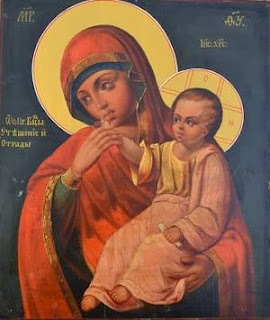 This icon of the Theotokos is connected with Vatopaidi Monastery. Tradition says that the name came from the Monastery because of a miraculous rescue of the son of Emperor Theodosius the Great by the Panagia. In honor of this event the icon was called "Joy", and later after the Monastery was rescued from bandits the name "Consolation" was added.